Last month I described a bit about my family history work at Glenbow Ranch Provincial Park (GRPP) as a member of the research team from the Archaeological Society of Alberta – Calgary Centre (ASA-CC). This month I thought I would explain our project at Glenbow, give you one family history story, and let you know a bit about this beautiful park. The ASA-CC has done field work (mapping and surveys and, last year, excavation) at the park for five seasons as part of our Glenbow Town and Quarry Project. We are studying the Glenbow Quarry and the associated village where the married workers and their families lived. This quarry was vital to our provincial history as it supplied the sandstone for the exterior of the Alberta Legislature Building and Government House, the former residence of the Lieutenant Governor of Alberta. Many buildings in Calgary were also constructed from this stone. Unfortunately, most people today know nothing about this interesting piece of our provincial history. We at the ASA-CC are out to fix that! As I discussed last month, I also do the historic research on the project, contacting descendants of the families that lived and worked there. One of the first photos we received was this one. The family that donated it had no idea why they had it since none of their family members were in it. It was labeled simply ‘Glenbow Residents’. It became my mission to identify the photo and the people in it. Like me, you might guess that it depicts a wedding, and you’d be right; notice the clergyman in the centre of the photo and the woman dressed in white with flowers in her hair. 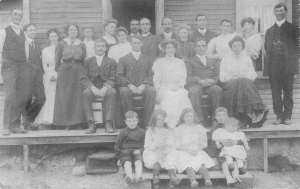 Eventually the couple in the upper right hand corner (Betty and Currey Wearmouth) were recognized by a family member, allowing me to date the photo to 1910 (because of baby Stennard on Betty’s shoulder). Then a distant relative picked out the bridal couple and pieces started clicking into place. I had the church record of the wedding already, identifying the Reverend (Ralph D. Harrison), and the date (Oct. 30, 1910), and was then able to contact other family members to put names to the rest of the bridal party (L to R: Arthur Hughes and Walter Hughes, brothers of the bride; Ethel Hughes, bride; Tom Gillard, groom; Eleanor Hughes, Walter’s wife). I’m still looking for the identities of the rest of the people in the photo – perhaps you recognize someone? If so, please let me know! This photo captures a happy moment in the history of Glenbow, links the stories of several interesting people together, and hints that there is so much more to find out. I get to tell lots of stories about Love and Loss, Hope and Hardship, and other tidbits from the History of This Great Province (cue the waving flags) when I guide a tour to the area of Glenbow Village during Historic Calgary Week. This will be my fourth year on the program. My tour runs the morning of July 26 and will be expanded this year to the area just below the quarry so I can explain our excavations there. I, and other members of the ASA-CC, will also be at the park for GRPP Day on July 19. We are there to let the general public know about archaeology in Alberta, our work in the Calgary area, and the history and archaeology at the park. Located along the Bow River, GRPP connects Calgary with Cochrane. It is accessed off Highway 1A, just east of the big hill coming out of Cochrane on the way to Calgary. A nice big sign now points you to the access onto Glenbow Road. This winding gravel road leads you to the park entrance. Hiking and cycling trails can be reached from the parking lot. The Interpretive Centre is staffed by volunteers most weekends. Summer is especially busy with many different programs for all ages offered by the park staff. If you are wondering about the name of the park and think it sounds familiar, you are right. ‘Glenbow’ has been used for the name of several things in the region. The term originated as the name for a water tower along the CPR line laid in 1883. It then designated a ranch, a quarry, a village, and a post office. The owner of the ranch eventually sold his land to Eric Harvie (lawyer, oil-baron, rancher and philanthropist), who later founded and funded the Glenbow Museum and Archives in downtown Calgary. Thanks to the generosity of the Harvie family, the ranch land became Glenbow Ranch Provincial Park, and all Albertans can now enjoy this awe-inspiring grassland landscape nestled along the mighty Bow. The Glenbow Town and Quarry Project keeps me busy with research of various kinds in the fields of family history and archaeology. I treasure the time I get to spend working in the park; it is a gorgeous place and has such a rich past (did I mention one of the paths goes right by tipi rings?). Best of all, it is a place where people can relax in a quiet, natural environment, just a stone’s throw from the metropolis of Calgary and the bedroom community of Cochrane. It seems when I turn off the double divided speedway that is Highway 1A, onto the graveled track to GRPP, that I am winding my way back in time and everything slows down. My eyes feast on the rainbow of wildflowers, I hear the osprey calling, I smell the grasses that rustle as I brush past them. I feel I am walking through history itself. I encourage you to come down to the park this summer, to enjoy its trails winding through the valley, possibly to try one of the park programs, or to say ‘Hi’ to one of the archaeologists who might be working there when you visit. Besides being a gorgeous natural environment, this is a place where, when you dig a little deeper, you discover that family histories tell the history of a community and its contribution to our province. This article was originally printed in the Bergen News and is being reprinted with permission. Photo courtesy of Walter Tremblay.